The N3 is a bit of an odd man out. A lot of people don’t quite know how to study for it because it didn’t exist before 2010. It was created to help learners move up from the old level 3 (now N4) to the old level 2 (now N2). It does this pretty well by adding more vocabulary and grammar, but not adding too many difficult skills like reading for inference. For more details about N3, I did a whole podcast episode on it a while back. The books that cover the grammar and vocabulary for this test are pretty accurate though. I personally recommend the So-matome series. I used the grammar book, and it really helped me get through the grammar section of the exam. There are some lists available on the web, but these don’t compare to doing some exercises with the grammar and really get a feel for it. However, you can go through all these exercises all day, but it doesn’t compare to the real test. There is a big difference between sitting down and studying for 15 to 30 minutes and sitting down and taking a test that can last 3 and a half hours (if you include the breaks). Even without the breaks, you are going to be testing for 140 minutes. That is enough to fry a brain if you are not prepared. So it is a pretty good idea to take a practice test or a mock test before you head into the exam. Note: This article covers just N3, but I have a JLPT N5 Practice Test and a JLPT N4 Practice Test as well. So, how should you actually go about practicing for the test? Well, unfortunately you don’t have the option of taking previous tests because the test didn’t exist before 2010. And since 2010, previous tests are no longer being released. So, there are no old tests to take like all the other levels. That gives you only two options. The first one is to take a JLPT N3 Mock Test. These tests are usually pretty helpful in that they resemble the real test, right down to the font and answer sheet that is used. Even the voices in the listening section are pretty close to the same voices on the real test. Making it an excellent choice to prepare for the exam. On top of it being a mock test, it also contains feedback to help you understand what you did wrong. The mock test also gives you advice on how to score higher on the exam as well. So, they can be a good deal and a real lifesaver when it comes to preparing for the exam. Here are some Anki flashcards that I made for the first 14 questions. After the first 14, there are text grammar and reading questions which can’t really be easily put into Anki. You can either add this to your personal deck or study them on their own. 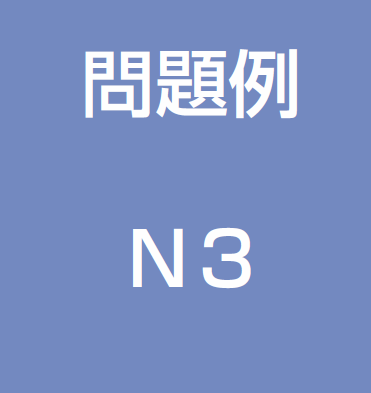 You can also download them off AnkiWeb by searching for “N3 Practice Test Questions”. 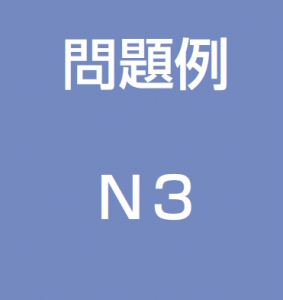 Take the JLPT N3 Sample Test. How was it? What was the most difficult part? P.S. Are you preparing for the N3? You are going to want to Sign up for the newsletter then! Thank you! I’ve given it already at the JLPT website, but I like having it conveniently downloaded onto my computer. 🙂 The notes and tips you added were useful, especially the recommended time spent. I feel that the sample was rather… easy? I was also thrilled to see the question on mensetsu, since I ran into that in some example sentence. ^o^ Then again, I gave this test like, three times. So, I’m panicking and thinking of buying the mock test, haha. It’s so expensive though! If you think about the fact that you might have to take the test again if you fail (plus wait another 6 or so months) the mock tests are a deal really. They also usually have good explanations of different sections of the test so you know what to look out for. Anyway, the practice test should at least give you a good start. I think the best idea is learning for N2, and taking N3:)) Lots of my friends are doing it, because for N3 passing you have to know lots of N2 Kanji and grammar, too. Now I am studying the N2 Reibun de Manabu Kanji to Kotoba, and I am reading articles of shinbun “Karin”. If somebody wants, I can send some number of this shinbun in e-mail. That’s exactly what I did, study for N2, but took N3. Seems to be the best for me. plz give me name of the shinbun and reading comprension which is better for me. np, hope it helps you ace the test! Hello i hv given exam in july of n3 result is still awaited. I want to improve my communication skills i have no one with whom i can converse in japanese what should i do to improve my communication skills. You need to find a good communication partner. Depending on where you live you might be able to find a native at your local University or online. I need help, i sat N3 twice and failed but my marks improved so it was a bit of a improvement on my side, i need some help on preparing a time table on what to study everyday, i have many N3 books which i ordered from Japan i just need some guidance. My N5 and N4 i aced but N3 no teacher and doing it on my own was not easy, Help would really be appreciated. I can spare two hours on tue and wed as i am off work and the rest of the days i can spare an hour to 30mins. i want to retake N3 again. How much work do you do with native materials? Do you have a regular chat partner? i have firends who have dne hte exam but no chat partner. We have a class for 2 hrs but not much is done in that class and to be honest i am overwhelmed with the books i have , i need a some guidance on how to make the time table and sit and study everyday to help me pass the exams. I Nairobi the exam is taken only in December, i want to prepare before that and pass this time. Oops spelling mistake friends and the class is once a week at the Japan information culture centre and its just once a week. I walk through a general overview of how to get ready for the test there. it’s a good expercience ..
i will directly go for the n3 test i dont have n5 or n4 but i know some kotoba but zero kanji. do i have a chance to pass? You should try the practice test and see. You can’t really pass without knowing a good amount of kanji though. Good luck, N3 is good level to shoot for! Hope to see you there!